The Nido Program is designed to meet the developmental needs of infants ages 6 weeks to 17 months. Dr. Montessori first described the infant environment as Nido (meaning Nest in Italian). The classroom environment is cozy, loving, secure, attentive and comforting – just like at home. The environment is intentionally designed to facilitate movement, develop language, and realize independence. Our Infant classes are intentionally small with lots of floor space to crawl and explore. We follow each infant’s regular schedule in sleeping, eating, and diaper-changing in order to maintain a secure and trusting environment. Coordinating Movement The Nido Infant environment is designed to maximize movement. We avoid activities and equipment that restrict a baby’s natural movement and desire to explore. Communicating with the World We enrich our Nido Infant classroom through song, music, and spoken language to provide a rich communication environment. Our Directresses express different ideas in order to help babies effectively communicate with their teachers, parents, and loved ones. Developing Independence As our infants prepare to transition to the Toddler environment (18 months – 2 ½ years), we encourage children to care for themselves. They learn to stand confidently, sit comfortably, grip strongly, and even hold a cup. Montessori materials in the Nido environment are curated to develop coordinated, precise movements. Infants can participate in part-time or full-time programs. 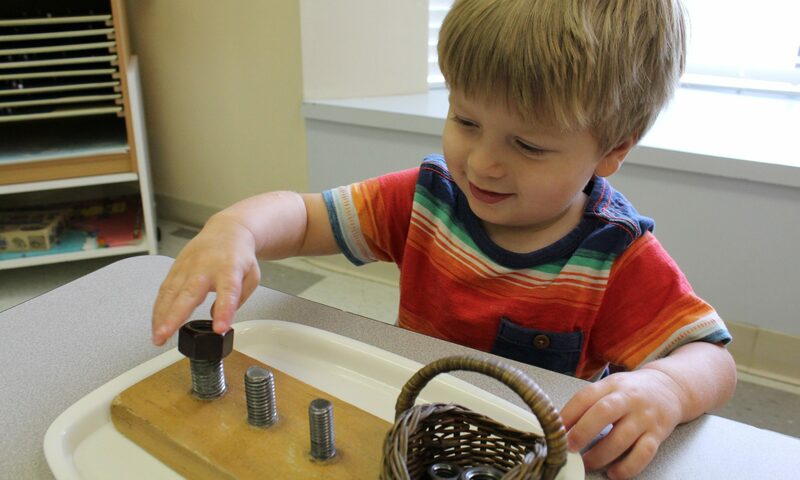 Programs are offered from 8:30 – 2:30 PM (Full Day Montessori) and 6:30 – 6:30 PM (Full Day Montessori and Extended Care).